From dotting meadows and fields to being carefully placed in floral landscape designs, daisy flowers are appreciated for their bold and cheery presentations. 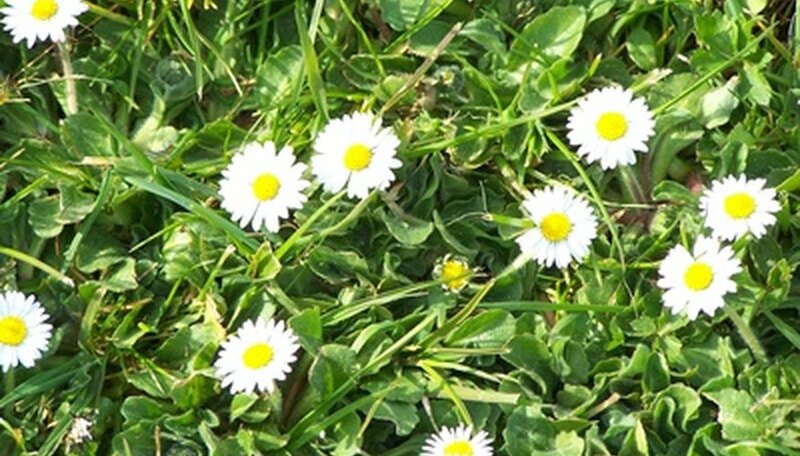 The name "daisy" comes from an Anglo-Saxon term that means, "day's eye," according to The Daisy Expert. There are many types of daisies, and they all belong to the Asteraceae family. The Shasta daisy (Chrysanthemum maximum) grows to 36 inches tall and blooms from June to July. It is a hardy perennial that is native to Europe. Shasta daisies grow in dense clusters in full sun to partial shade, producing flowers with white petals and bold yellow centers. The African daisy (Dimorphotheca aurantiaca) grows to 18 inches tall and blooms from April to August. It is a hardy annual that is native to South Africa. In the United States, it grows abundantly in the Southwest, as stated by Texas A&M University. African daisy flowers thrive in full sun exposure. The flowers have dark centers and petals that bloom in varying shades of orange, yellow and white. They ox-eyed daisy (Chrysanthemum leucanthemum) grows to 24 inches tall and blooms from May through July. Native to Europe, the ox-eyed daisy is a hardy perennial that now grows in many parts of the United States. It grows in partial shade to full sun exposure, and its flowers have bold yellow centers surrounded by crisp white petals. Also known as Gerbera daisy, named after the German naturalist, Traug Gerber, the Transvaal daisy (Gerbera jamesonii) is native to South Africa. The flowers grow to 18 inches tall and bloom in late spring, early fall and throughout the year, depending on the climate. A perennial flowering plant that blooms in shades of white, yellow, orange, pink, red and sometimes a combination of colors, Transvaal daisy prefers full sun exposure. Tahoka daisy, or prairie aster, (Machaeranthera tanacetifolia) grows to 12 inches tall and is native to the Midwestern United States. Easily identified by its purple flower petals surrounding bold yellow centers, Tahoka daisy is an annual that blooms from May through October, and it prefers the full sun to partial shade exposure. It is also known as Tanseyleaf tansyaster and tansyaster. Also known as Arkansas lazy daisy and Arkansas dozedaisy, lazy daisy (Aphanostephus skirrhobasis) grows to 2 feet tall and is native to the Southern regions of the United States. Its flower heads are no more than 2 inches in diameter, and they are in bloom from March through August. Lazy daisy thrives in full-sun exposure.